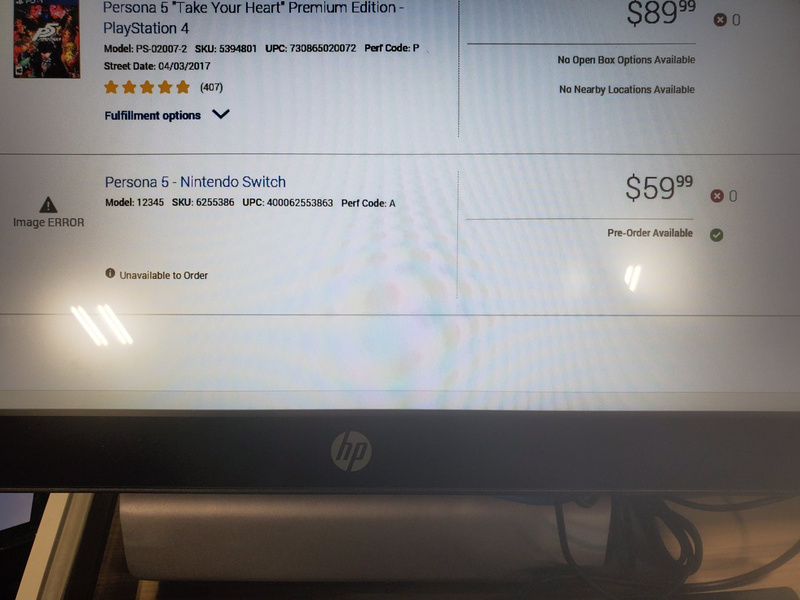 A leak via Best Buy's internal employee terminal suggests Persona 5, Metroid Prime Trilogy and The Legend of Zelda: A Link to the Past will all be released on the Nintendo Switch at some point in the near future. This follows the apparent leak of Joker's render in Super Smash Bros. Ultimate over the weekend. If these listings are correct, it would make a lot of sense considering the ongoing rumours over the past couple of months. Since the reveal of Joker for Super Smash Bros. Ultimate, Persona 5 has been rumoured for the Switch. 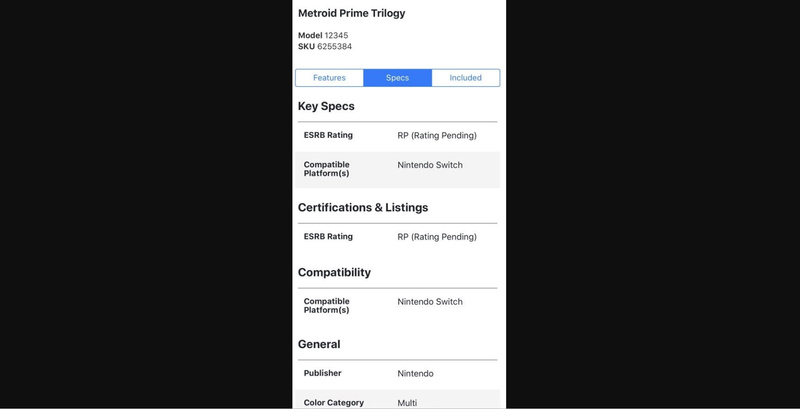 The Metroid Prime Trilogy was first spotted on a Swedish retailer website last September and more recently in March – prior to the reveal of Cadence of Hyrule: Crypt of the NecroDancer – we found out The Legend of Zelda: Link's Awakening might not be the only 2D Zelda game coming to Nintendo's hybrid device this year. What do you make of this? Tell us down below. None of this is surprising, except the Link to the Past part. Maybe it’ll get a remake, a la Link’s Awakening? As employees of Best Buy have mentioned, their internal system is not accessible for your average employee. And Best Buy has an immaculate track record for not posting fake listings. The fact they just leaked the Joker render within the past week tells me they just got a batch of new information. And given their good track record with not posting fakes, I’m inclined to think this is real. Metroid and Persona are pretty much given already as they were dropped by king Zell and other dependable leakers- numerous leakers. What’s wild to me is the Zelda listing, but the more I think about it it’s probably just an eShop code sold on a card like Pokémon yellow was for 3DS. Perhaps it’s going to be one of the announcements at an upcoming “Goodbye From Reggie” Direct. If true, as soon as it’s confirmed I’m gonna call in to work and party all night in celebration. This lines up with that rumor of another Zelda game being released this year. My body is super ready for this. Ill take Metriod Trilogy, and LTTP they can keep P5 and while there at it remove Joker..
Prime... please please please... PLEASE! Hopefully they list SNES, N64, and GameCube games as purchaseable. Not a fan of Non-Ownable NESFLIX. Could it be a port of a Link Between Worlds that includes a remake of Link to the Past? It would be very easy to program a version of that due to the increased memory in the switch. ALL ABOARD THE SPRING DIRECT HYPE TRAIN!!!! On a serious note, if this is true, I'd be more than happy. I've been wanting to try Persona 5 but been wanting it on a portable system. Metroid Prime Trilogy is also great news as I wasn't expecting it for a lot longer due to the Prime 4 delay. And A Link to the Past... that's a wild card. I'd be happy if it was a full remaster or just a simple port on the eShop. Regardless, I hope this rumor is true! Where's my credit card? Oh there it is! Take my money!!! Yes!!!!! Metroid!!!! I'll be getting a switch asap if this is true, had to sell my old ones for medical bills! Was waiting on a special edition Pokemon or Animal Crossing one but if this is true I gotta get one for some Prime action. Um were they fooled by IGN's "Everything is Coming to Switch" Direct? Pretty sure all three of these were mentioned. Is best buy also gonna add a listing for Wand of Gamelon, Carmax, and Dungeons and Brazzers next? Seems they did show a brief half second banner for it but along side a dozen other Zelda games. If somebody mistook that video for being real there would be a lot more listings than just this. And that would be a very odd one to cherry pick out of all those Zelda games. @illmatic20xx Persona 5 is a modern JRPG Masterpiece. It's wonderful that more people might get to play it on their system of choice. Why on Earth would you be so callous as to deny them that opprotunity? That's quite a narcissistic attitude to have. MP Trilogy and ALttP would be fantastic for me. Some of my all time favourite games right there. Plus, Metroid Prime in HD would be amazing. Persona...well I know nothing about the series. Never even heard about it before this Switch rumour. Jumping in a series I've never even heard of at entry 5 is kinda unappealing. @-Juice- IMO its overated. No where near a masterpiece lol its style and music is good, but that's it im glad more people get chance to see how overrated it is though. Perhaps Nintendo foresaw the mixed reactions of Link's Awakening remake and has A Link to the Past remake to counter that. If that's the case, then it is very smart of Nintendo. Best Buy is stupid, it's not A Link to the Past that's coming to the Switch, it's Link's Awakening. I know both games use to had the same logo and box art back then but c'mon at least read the freaking subtitle. @SamusLv7 maybe they were like we already have the engine to remake 2d Zelda why not do A Link to the Past and combine it with Link's Awakening. 2 classics would be worth the price tag. Or it could be a remaster. Which, if true, holy crap, take my money. @Kainbrightside With the money that could generate an A Link to the Past remake, even I being Nintendo would sell it apart. So sadly I don't think they'll put the two on one cartridge. Isn't Links Awakening the sequel to A Link to the Past? Would be cool if they just remade both games into one cartridge. And I for one am on board with Persona 5, I don't have a PS4 so I couldn't play it, and I didn't feel like buying a PS3 version of it (because I actually didn't know they made one for the PS3 until like a few weeks ago), so I'll wait to play this one the Switch. I love the music in Persona 5. I've been a fan of the games, played P3 and P4 and this random dancing one, which was fun. @SamusLv7 I get what you mean, but it all depends on what price they'll end up charging for Link's Awakening. I'm a huge Zelda fan but I'd still be hesitant if they charged full price for a remake of a game that's incredibly short by today's standards. But I'd be a day one buyer if they included another 2d Zelda remake. Idk though because they did charge full price for Samus Returns. One thing is for sure... Atlus shouldve thought ahead when working with Nintendo, for Nintendo has an... impressive track record of keeping secrets. They should’ve realized the risks. Now the Nintendo ninjas and maybe even the Phantom Thieves are going to come at Best Buy for blowing their cover... On the bright side tho, its a refreshing jab of sorts against announcements of announcements. @Kainbrightside Good point, also I haven't discard that possibility as it could end up being two games in one. We'll have to wait to see what Nintendo decides to do. 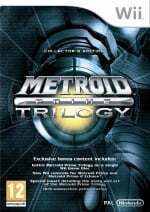 A physical copy of Metroid Prime Trilogy would be interesting (which I assume is why BestBuy would have the info). An enhanced port of the Wii version would be interesting. And even if it is the Wii versions, it would be interesting for those that skipped the Wii U digital versions. If this is real, I'm going to be broke. They are probably using the same engine that they used for the Link's Awakening remake (that looks like A Link Between Worlds). 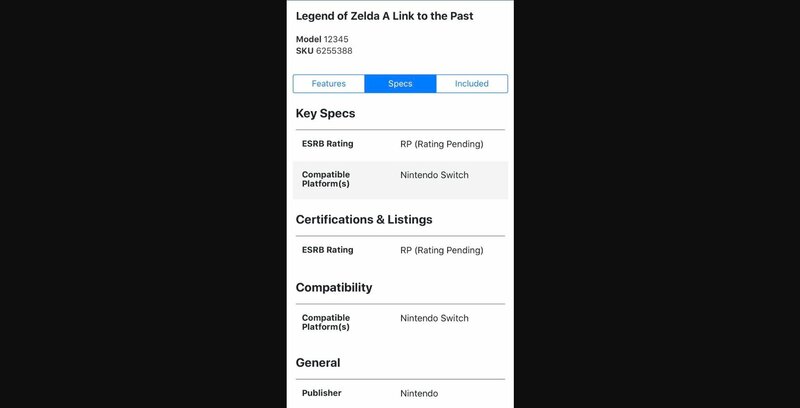 If A Link to the Past was a port it wouldn't get a physical release on Switch. Metroid Prime Trilogy was on Wii and Wii U, it's a no-brainer AND an easy prediction. "It'll be in the direct!" "It'll be at the game awards!" "It'll be announced shortly now that they've scrapped prime 4!" "It'll be in this next direct, I swear!" "Best buy leaked it, it's coming for sure now!" @retro_player_22 but best buy already has a listing for Link’s Awakening??? Unless this is a trolly post in which case......keep on trolling! @Kainbrightside Yeah, they did charge full for Samus Returns. So it's best to remember it in case they do the same. @BlueOcean I really hope that isn't the case A Link to the Past has a more serious theme where they even presented the king of hyrule being a skeleton thanks to Agahing (sorry if spell it wrong). @Kainbrightside Samus Returns, though, deserved to be full price. It was a complete remake/reimagining with some of the best 3D visuals on the 3DS. @SamusLv7 Yep, I liked A Link Between Worlds but I don't really like how Link's Awakening remake looks and that style wouldn't suit A Link to the Past, which is kind of dark. They could change things and colours using the new engine but I don't know if that plastic toon style would look good on A Link to the Past. If the rumour is true it must be a remake though because a SNES port wouldn't get a physical release on Switch and retailers don't list digital-only games (if it's not a mistake of course). @Tandy255 I'm not arguing the price I'm just saying there's precedent already that might have them charge full price for the Link's Awakening remake. I'm hoping they won't though. 1 They didn’t get the title wrong, because Zelda Link’s Awakening already has a listing on the site. 2 They do not have a long history of fake leaks. In fact there’s only one or two instances in the history of their entire company can I think where they listed a wrong game (which, every major retailer out there has done that). And the instance in question you linked is not from Best Buy US, but from BestBuy Canada, which are two separate entities in two separate countries. Just like Amazon US is a completely different animal from Amazon Italy or Amazon Japan. why the hell would LttP come to the Switch? i mean why a single SNES game would? @Kainbrightside Also Link's Awakening remake is apparently full price. @SamusLv7 I updated my comment to explain a bit better what I mean but don't you think that the engine of Link's Awakening remake is the engine of A Link Between Worlds but in HD and more plastic and shinier? I might be wrong. Link's Awakening remake looks worse somehow. @BlueOcean could just be a placeholder price. Idk, but a 1 to 1 remake of Link's Awakening is a hard sell if that's the case. @GetShulked agreed - I’d much rather purchase remastered versions of these old games in 1080p. I'm totally getting that prime trilogy! I'll believe it when I see an official announcement. So many rumors, so little hard evidence. Getting pretty tired of that. @GetShulked you don't own digital downloads either. I really hope Metroid prime trilogy comes as a full remake in a physical release rather than just simply uprezzed. @Trajan sure, but at least it’s not going to disappear suddenly one day. @ReaderRagfish now: it's going to be in the April direct! (Possibly) later: e3 this year I just know it! @BlueOcean Now that I think it, it has similarities to A Link Between Worlds. Perhaps it is an enhanced one though, it is hard to know because the characters in this new remake look very chibi compared to ones in A Link Between Worlds. A Direct at this point would make sense and they may as well just go ahead with it as Reggie steps down soon this month and I wish him the best. Itll be the last Direct before E3 anyway. But I own my system it's downloaded on. And it won't up and disappear like NES games after NESFLIX is discontinued at the end of the Switch's lifespan. @SamusLv7 Yeah, that's the word, chibi. Link's Awakening remake is chibi and looks like a parody. A Link Between Worlds looks right. @andykara2003 @GetShulked it will when the servers go down and you have a hard drive failure or error. @MotionMan Nah it could still happen, someone must seen Link's Awakening materials and thought it could be another new game even if they had a listing for the game before. It's called human error and it happens. @JaxonH It could still be a late Best Buy April Fool though. No way Nintendo is milking Zelda 3 times this year especially when they are still hiring for more people to make a brand new one that is not A Link to the Past. Link's Awakening and Cadence of Hyrule are enough. @Trajan Like a disc/cartridge failure. Problem is you need to be subscribed to NESflix to play NES games on Switch and also Nintendo discontinuing services when they have a new thing to sell. While I admit that there's a bit of steam behind this one if prominent leakers are to be believed, I'm still skeptical. We'll find out soon enough I suppose. I would love for Nintendo to update Metroid Prime Hunters for the Switch (since the 3ds is technically dead) with HD graphics and better controls. Maybe include it in the Prime Trilogy as a bonus or something. @Trajan I would have lost it even earlier had it been tied to NESFLIX. "IF" that happened, better to have it longer, than losing it even sooner when the servers do go down. @BlueOcean one of my favorite favorite cutscene-like speech of A Link Between Worlds is when Hilda tells Zelda that Lorule once had heroes among other things. I don't think that Link's Awakening remake can transmit me the emotion of such moments with his art style. @GetShulked I agree with you, but you're talking about an easily obtainable game that would be free on a service you're already paying for. You can own ALTTP forever on SNES, Game Boy Advance, and the SNES classic. @Trajan You mean "IF" (and that's a big IF). Never had that issue with any of the games I've owned. Switch Online WILL be discontinued at some point. My game getting corrupted however is not a certainty, or even very likely based on past experience. 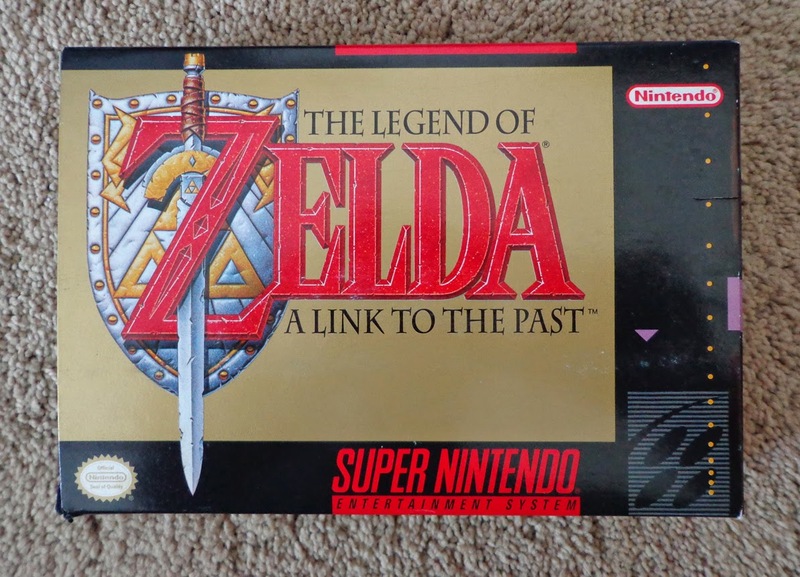 Is Legend of Zelda: A Link to the Past assumed to be a remake or a port from the SNES selling as a retail game? I hope it's the aforementioned. @GetShulked everything fails eventually. Modern tech isn't as robust. Many people have gotten corrupted games from no where. The standard answer is delete and redownload. But lets be honest, ALTTP isn't a difficult game to replace. @Trajan On all platforms except Nintendo's (they have shut DSi and Wii shops down) you can download games again except for unusual copyright conflicts. A disc or cartridge can be damaged or lost. I like physical on Nintendo and digital everywhere else because of this. NESflix is a joke compared to Xbox Game Pass but I guess that if you look at NESflix as an extra for paying for online for a few games on Switch isn't that bad... I suppose... I prefer the Virtual Console, honestly. Nintendo is prone to shutting services down but hard disc/flash drives failures haven't happened to me except for portable HDDs that I use for laptops and move around (and fall). So DSi shop closed, Wii shop closed and downloaded games still working. Yep everything fails eventually for sure. Just want longer term access than a shorter one. @Trajan Link to the Past would be nice, but I actually have that one on my N3DS. I'm hoping the most for purchaseable N64 and GameCube games on Switch since there aren't many games from those systems that can be played portably. Don't want them to be part of the "rent only" structure now that we finally have a powerful enough portable console to run them. I’d love a remaster of ALttP done in the Link’s Awakening remake style. It’s adorable. This is an April’s fool. The employee could be taking these shots from the testing platform of bestbuy website. And like on any testing platform you can create your own data set. Look closely at all 3 items, the Model field is 12345 which clearly indicates that this is just test data with no credibility. Change the visuals all you want to Link to the Past, but I must insist that Link keeps the pink hair. A Link to the Past at Best Buy? How? That game is too small and too cheap to get a physical release. Aren't "leaks" like these often completely false? @Ttimer5 As a kid I thought LA was the sequel to ALttP but now I'm not so sure if they are any more related than any other Zelda sequels. I'd check my manual but it seems I somehow managed to keep the box to my Player's Choice copy of Link's Awakening but lose the manual over the years. @Kadmario that my friend is a very good spot. That number would most likely be unique on such a database as well so these are almost certainly mock ups to get people excited. That said if these were announced I'd have all 3 day of release! @GetShulked Completely agree with the N64 and Game Cube on Switch. Nintendo could earn more money if they put them in the Switch's e-shop, especially the Game Cube ones as they weren't available in the Wii U (with the exception of Wind Waker, Twilight Princess, and in some way, Metroid Prime 1 and 2 thanks to the Trilogy). We are getting FF Crystal Chronicles 1 which is a Game Cube game, so once it comes to the e-shop, they (Nintendo) don't have an excuse of not doing the same with their games. @Reploid exactly what I was thinking. They stated that another unnamed Zelda title was in the works didn't they. Great news on all 3 games. OMFG... I can see myself spending around 1K (mario maker 2, fire emblem, astral chain, animal crossing, the nindies and the list goes on and on and on), euros this year in my swtich... my wallet will bleed.. I really want to try Metroid Prime. I only finished Metroid Zero Mission of all Metroid games. I own Metroid Fusion but I am stuck on the anti-gravity boss. Not putting enough effort to beat him I guess. The rumours is going strong to be true. Exelento! PLEASE DO NOT RUIN LINK TO THE PAST THE WAY YOU HAVE LINKS AWAKENING! I'd rather wait until it's all confirmed, bit I still love hearing about rumours like this so don't stop reporting on them. They usually Indicate that a NDirect is round the corner. Anyone else notice that? @-Juice- I agree that more platforms is actually good for developers and consumers (except some shareholders and “the spring flower” fanboys). The dev will get more money for their good works and more people will have a chance to play. @SamuraiPanda That is also my fear. @Kadmario 12345? That's amazing, I've got the same combination on my luggage. Persona 5 would be amazing on Switch and if it's the new "The Royal" version then I'll definitely be playing through it again. Excited by Metroid Prime Trilogy too as I never played the first two games. Really hope that waggle controls are enabled through the Joy Cons, loved the controls in MP3. 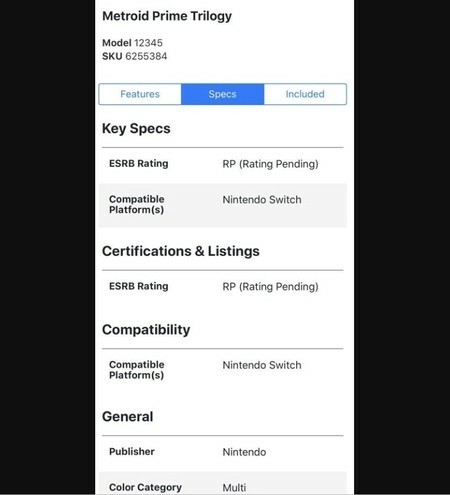 @retro_player_22 There's already slot for Link's Awakening in the listing, and because it was announced already that SKU is already public. "Certainly Nintendo must know by now that Link's Awakening remake received mixed reactions." The YouTube trailer for Links Awakening has a 122K likes vs 4.7K dislikes, a 96% like ratio. That's hardly mixed at all. Rumors about Prime Trilogy and Persona 5 on Switch have existed for months. Link to the Past is an interesting one. There is no way Nintendo is going to remake 2 classic Zelda titles in a single year. This does remind me of an instance back in 2014 when Zelda 2 entered Best Buys' product listing page as a Wii U release. A few months later, at E3 2014, Zelda Wii U (i.e. Breath of the Wild) was shown off for the first time. might as well stop caring until it gets confirmed. @Trajan that’s why I’m hoping for a physical release for Metroid Prime trilogy. I buy all my games in physical, partly for that reason. I think we have a reasonable chance for MPT - here’s hoping! @westman98 Well I do not like the new art style. In fact I hate it, but I would still upvote the trailer since I'm glad that they are remaking it. Therefore, I don't think that that ratio is a good indicator for it. Still, I saw more positive than negative reactions to it. Link's Awakening is 15 hours. I don't know how that's "incredibly short by today's standards" in terms of it being full-price, when it's longer than the vast majority of full-priced retail games Nintendo has published on the Switch so far. I mean, Yoshi's Crafted World just released at full-price and Link's Awakening is twice as long as that. It's longer than Mario Odyssey, Tropical Freeze, Bayonetta, Fire Emblem Warriors, NSMBUDX, etc, etc. In fact, speaking of A Link to the Past, it's the same length as that, and that retailed for more than full-price back in the day, if you take inflation into account. Obviously it's not some Xenoblade Chronicles 70 hour monster or something, but most games aren't (thankfully). Something that would be cool is if Metroid Prime Trilogy HD (whenever it get released), let you unlock Prime Hunters if you beat Prime 1 and 2. That way, you can play through all the Prime games chronologically. I'll keep my expectations low and be happy if even just one of these rumors turns out to be the real deal. I rather they remaster the NES Zelda games and tone down on the difficulty for both games. Obviously not going to get hooked in by rumours but I wouldn’t complain. I have P5 on PS3 but the portability of the Switch has proven so useful to me that for a big JRPG like this it would be a huge help as I barely have time these days to sit down and play. Have been looking for an opportunity to reply Metroid Prime so again won’t complain. LTTP is quite the oddity. Don’t get me wrong if they did the unthinkable and rereleased it physically on Switch (release Super Metroid too please) that would just blow my mind. It's too soon for a Link to the Past remake, as it would completely overshadow the upcoming Link's Awakening Remake. I would buy them all instantly. So i hope the rumors are true. Hoping for Metroid but still with motion controls. Someone just typed the wrong zelda when was typing the register. Is the most probable. To be honest, I think a link to the past is a mistake. They probobly mean link's awakening. Do you get off on hating on Persona? You make the same comment on every article that even briefly mentions the series. Grow up and get over it like a big boy and move on with your life. When’s the April direct predicted to be? @thesilverbrick Near enough Link Between Worlds, so I doubt it. 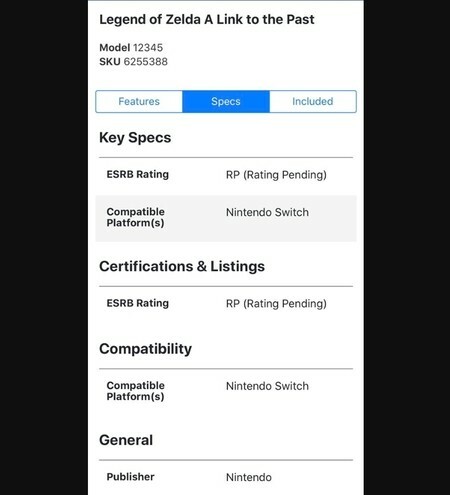 It would be nice to have on a snes upgrade to the nes app online customers get... Otherwise it'll be a miss from me. @Reploid i think the second 2d zelda is cadence of hyrule. Link to the past remake is possible though if they use link's awaking engine. The question for me remains is if link's awaking remake is using unreal engine 4 or not. LoZ:LttP is hands down my favorite game of all time. So many memories playing this game. If this is true, and they do it like LoZ:LA I will be one happy camper! If this is fake, then I'll just continue to play it on my SNES mini. I've already played A Link to the Past too many times and I'm not sure I would replay the three Metroid games despite all three being awesome. Persona though, I've never played a Persona game before so I would be interested. But if the price point was good on the potential remakes then I could possibly be interested in those also. Persona 5 is a great game, and as long as it's got the content additions and isn't just the base game i'll possibly be double dipping. I'm also up for Metroid Prime Trilogy. Only one of these I'm not as interested in is LttP, but that's mainly because I've played it SOOOO many times including recently playing a randomizer run of it with super metroid together (that was SOOO fun, would be awesome if nintendo ever did their own randomizers though doubtful). However I'm still glad it's coming for anyone that may have never played it. A Link to the Past seems unlikely. I wouldn’t argue with it, but I don’t think it’s going to happen. Yes but is it Metroid Prime Trilogy in HD? MP Trilogy will be great value for the money even if it's not remastered. I would love to play Metroid Prime again! Perfect game imo. I'm so excited for Persona 5. Soon I can own Okami, TWEWY and Persona 5, three of the most stylistic RPGs of all time, all on one Nintendo portable where I can also play the next big Pokemon. Dream come true. I'll take any excuse to play Metroid Prime again, but maybe this time I'll actually finish Metroid Prime 3: Corruption. I try so hard not to get hyped over rumors, but this is Metroid Prime. I want this! @subpopz Their stories are unrelated just like FF. Get it. BRILLIANT game. Epic. Trust me. I'd like to believe it, but at the same time, I don't want to get my hopes up. Regardless, I'm still waiting for news on Pikmin 4. Come on, Nintendo. NESFlix... I'm definitely stealing that one. 1. Accidentally posting the same game twice is well within the realm of possibility. 2. So major retailers do occasionally list the wrong game. I rest my case. @PBandSmelly Link to the Past has only been ported to Game Boy Advance physically, last I checked. Virtual console is more emulation than a port or remake. I'd love to see A Link to the Past remade and bundled with a HD port of A Link Between Worlds. @Antraxx777 Agree with that. Perhaps I should have said that in the my reply from above 😅 I was tired at that time. Big whoop, some old games. Show me Pikmin 4, dangit! It’s coming to take your money, bwaahaha!! I think that's a typo and they meant "Link's Awakening" not "Link to the past". I don't see releasing two zelda remakes in the same year. It's weird. @PBandSmelly I hear you. Environmentally, ALBW is immensely similar to ALTTP. But in a tense of plot and theme, while having the same foundation they both stray off in different directions, which is what makes ALBW a different game in the end. Im just saying I want a different map, yknow? @subpopz Don't worry each game is not related to each other with a different cast of characters and story. This pretty much confirms the long rumored P5 release on Switch (I can already imagine fanboys having a heart attack) along with the newly opened website with more information being revealed on the 25th of this month. As for Zelda I guess it's simply a labeling mistake in their system, and I think MP trilogy was rumored before, probably getting an announcement at E3. Would help to lessen the pain of waiting who knows how long for MP4. I may have to quadruple dip on the Metroid Prime Trilogy (already have it on NGC, Wii and Wii U). How did you get MP3 on gamecube? @Reploid That's interesting. I hope they hold one off for next year. Weren't these titles revealed in the 1st of April "Nintendo Direct?" If an employee would confuse the two games, they would also NOT know that the existing entry is for the same game, now would they? Best Buy is not one person. My thoughts exactly,although a remake of Link to the past using the Breath of the wild engine I could also get behind. I hope that the Metroid Trilogy is a remaster of the games. I love them all especially the first but they are showing their age in various ways. Link to the past is in my top 5 game list but how many times can I play it? Enough already! I had MP1, MP2 on NGC and MP3 on Wii. Then I bought the steel book collection on the Wii and then the digital version on Wii U. So I've bought the trilogy 3 times already. I've got the MPTrilogy steel book collection, but my Wii is gone and my Wii U has died and I'm not about to spend the money to replace either. Having the trilogy on Switch would be fantastic. And of course when/if Persona 5 hits Switch, that's a no brainer day one purchase. Zelda LTTP...it is my favorite Zelda and all, but I have that on the SNES Classic so I won't bother with that. God I hope if there is a LttP remake that it has a four swords style co-op component. It's so obvious P5 is coming out on Switch. The real question is, presuming every fan already has it on PS4, just like FFX and XII, is anyone actually going to buy it just for the novelty of playing it on the bus? Normally I'm not excited about remakes, remasters, reboots, ports, ports of ports, especially old games. but I'm hype for that metroid. Nintendo lost me during the N64 days to sony and so on. So I didn't get a chance to see how metroid evolved.